Alfred Hitchcock was a funny guy. Certainly he was a master at setting up a movie thrill and keeping us on the edge of our seats, but it is the sly humour that permeates his best work that sets him above other directors in the field. When our heroes find themselves in dire straits they invariably resort to cracking wise. The self-deprecating, deadpan humour in the scripts for The 39 Steps, The Lady Vanishes and The Man Who Knew Too Much very much align with the personality Hitch presented to the world. It was that droll personality that made the director such a popular host of TVs Alfred Hitchcock Presents and The Alfred Hitchcock Hour. Many of his villains display this wonderfully wry sensibility from Paul Lukas in The Lady Vanishes to Herbert Marshall in Foreign Correspondent to Ray Milland in Dial M for Murder to James Mason in North by Northwest. There are times during the pictures where we almost root for the rotters! British author Jack Trevor Story's novel The Trouble with Harry was published in 1949. Story was a prolific writer in a number of genres and went on to be a television writer and personality. John Michael Hayes wrote the screenplay, one of four collaborations with Hitchcock during this period including Rear Window, To Catch a Thief and The Man Who Knew Too Much. In The Trouble With Harry Hitch and Hayes made a cinematic drink of dry, nonsensical British humour and served it to the American public straight, no chaser. Box office success did not follow and the film would not find its audience for quite a while. Firstly, this was one of the legacy picture lost to public viewing until the 1980s and secondly, the joys of British humour courtesy of PBS, etc. had finally found its niche in America. 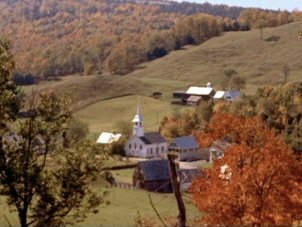 The beautiful and tranquil Vermont village, stunningly filmed in Technicolor by Hitch's favourite collaborator Robert Burks, is populated by a most quirky citizenry. Upon first meeting these individuals you may find yourself shaking your head and wondering about their sanity. However, by the end of the picture you will find yourself in accord with their off-kilter worldview. It may not even take that long as you are helped along by Saul Steinberg's amusing opening credits accompanied by Bernard Herrmann's cheeky score, his first with Hitchcock. Arnie: "I'll try not to see him tomorrow." A young boy, Arnie played by Jerry Mathers, discovers a corpse in the midst of the multi-coloured fallen leaves. This discovery does not leave the kid traumatized as he is a kid and his mind switches to other things of interest quickly. However, he is prescient enough to inform his mother, Jennifer played by Shirley MacLaine in her screen debut, of the man in the woods. Jennifer, instead of being disturbed by the occurrence, seems rather pleased. Arnie: "You think she's pretty, you should see my slingshot." A retired sea captain (more or less), Albert played by Edmund Gwenn, believes himself to be inadvertently responsible for the death of the stranger through a hunting accident. A local artist (modern), Sam played by John Forsythe, endeavours to assist the captain in his attempts to avoid any difficulties with authority figures. This assistance leads Sam to the lovely young mother and his interest increases. Miss Gravely: "What seems to be the trouble, Captain?" 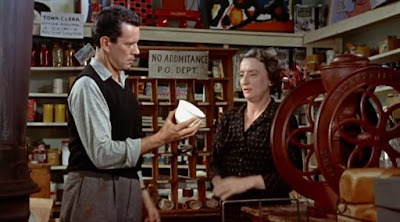 Meanwhile, the captain also becomes involved in an unexpected romance with Miss Gravely played by Mildred Natwick. The spinster has her own reasons for suspecting she is at the heart of the matter plaguing this assembled band of conspirators. It is all so annoying! Mildred Dunnock plays storekeeper Mrs. Wiggs. She knows everybody. She thinks she knows everything, but she's not in on the Harry business. After all, her son Calvin, played by Royal Dano, is a deputy sheriff. When you are trying to hide a murdered man, it does not pay to have a deputy sheriff hanging about. Miss Gravely: "I wanted to be certain it would fit a man." The acting ensemble expertly handles the silliness of the appearing and disappearing body of Harry Worp, the man who will not stay buried. So many things might go wrong. Can Arnie be trusted to keep his mouth shut? Will pride stand in the way of Sam actually making a sale? What about that teacup Miss Gravely purchases? What about Jennifer's short fuse? 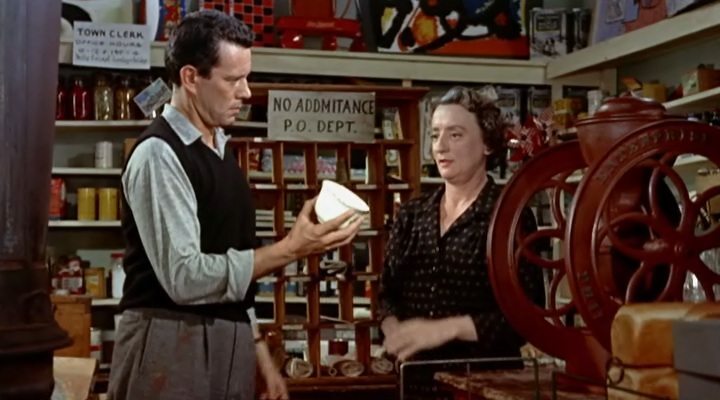 The Trouble with Harry makes me laugh and, in many ways, is a thoughtful and comforting movie. Prepare your eyes for a feast of Technicolor and your funny bone for a tickling that will last long after the movie has ended. 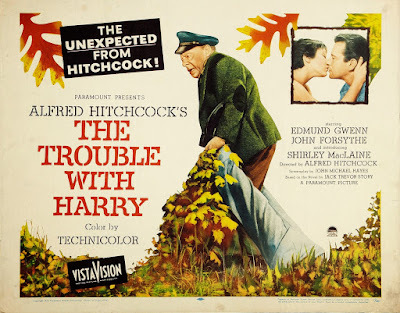 TCM is screening The Trouble With Harry on Sunday, January 1st at 4:30 am. It ends a full day of Hitchcock films that begins at 6:00 am with Rope. Remember, in the world of TCM a day is begins at 6 am and ends the following morning, same time. In the outside world, we might consider it 4:30 am on Monday the 2nd of January. If you are confused, The Trouble With Harry will not help you! I need to revisit this one again. it's been a real long time since I watched it. Thanks for the heads up. Always love his dark humor. I think TCM is starting the new year off in the right direction with the Hitchcock marathon. Happy New Year! For some reason I just can't connect with this film. I love the premise and the cast and the gorgeous scenery, but it's not a film I love. However, like John at 24 Frames said above, it's been a couple of years since I've seen this film. Now that I've read your thoughts, I'm going to revisit it. I'm so glad you saw something in The Trouble With Harry this time around. I've known lots of movies like that. It makes them sweeter. 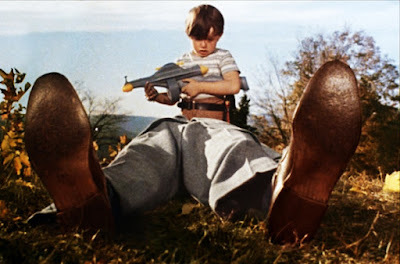 Like Silver Screenings, it took me a couple of viewing to appreciate THE TROUBLE WITH HARRY--but I have become a fan. 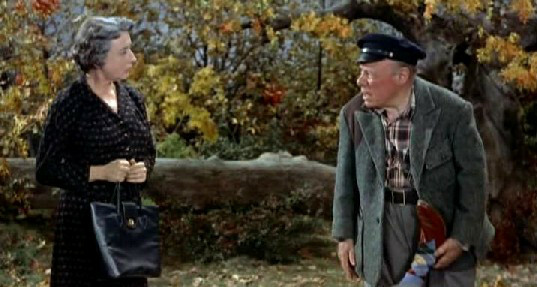 What I love about it is Hitchcock's portrait of the picturesque New England town. 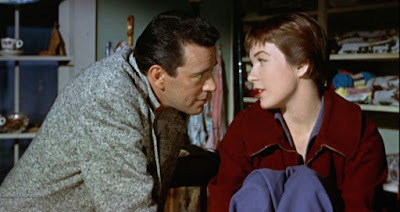 In that way, it would pair nicely with SHADOW OF A DOUBT--another Hitch flick about a quiet American town--on a double-feature. That would be a great double bill. You should do this for a living. I do get a kick out of the quirky folks in that beautiful setting. That cinematography is breathtaking. I had a habit of gifting my kids at Christmas with things they didn't immediately take to. This was not intentional. However, by the time the next year rolled around, the old gift had become a favourite. I think it is that way with some movies. Either we or it needs to percolate. You would think some producer of musicals would have snapped Shirley up. Entertainment is certainly a funny business. It's as if TCM wanted to show us a good time to start off the year. WELL! NOW I need to rewatch this! I have it on blu-ray too in the fantastic Hitchcock Masterpiece Collection. As I read your entertaining write-up it occurred to me that I may not have been mature enough to enjoy this one when I watched it, one of the few Hitchcock movies I haven't had the appetite for again. You may have changed that.